Chant’Ouest, both competition and show, is in Vancouver this year ! Come cheer on emerging singer-songwriters from North and Western Canada. Each of the artists was the winner of a provincial music competition in their respective province. They will be measure uo to each other at Chant’Ouest to determine the two winners of this great contest. The two winners will have the opportunity to represent Canada’s Nort and West at the renowned Granby International song Festival in Quebec in 2019. Tickets are now on sale for 20 $. Visit the online ticket office to reserve your seats. Hurry up, places are limited ! 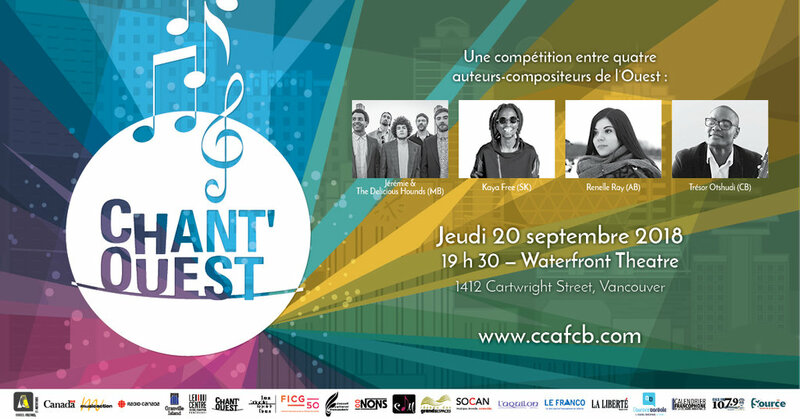 More specifically, Chant’Ouest is a unique platform for francophone artists from northern and western Canada to get their first experience in the music industry. In addition to a most rewarding stage experience, this platform offers candidates individual training supervised by a professional team. Whether or not the artists win the highest honors, they all come out winners, enriched by stage experience, opportunites, friendships and dreams.